Online Video Editor tools have made the job of video editing a lot easier. You might be thinking that online video editing software doesn’t have advanced video editing features but it is not true, as you can easily edit your video online with powerful video and photo effects. All you need to have is a good browser and a smooth Internet connection for uploading and downloading videos and online video editing. One advantage of online video editors is that they don’t need to download anything on your PC. Just start editing videos on the cloud straightaway. Some online tools will also include video converter and photo editors so that you can get an all in one package for all your video editing needs. I have tried to gather a few good online movie editor tools so you can do video editing online easily with advanced and powerful tools and features. If you are looking for Desktop based video editing tools, you may check out Movavi Video Suite and VideoLAN Video Editor. Online video editing is useful for tasks like creating social media videos, video marketing, creating smaller tutorial video clips, videos intros, create interesting video stories etc. Now let’s go through our list of 6 best free online video editing apps. ClipChamp is a decent tool to edit your videos online. It has both free and paid versions. With the free version you have few limitations, but it gives you all primary and basic editing to your videos. You can edit videos up to 5 minutes with a 1080p quality movie with a free account. The free account gives you the facility to edit 5 videos per month. If you are editing videos just for fun, the free account will be more than enough for you if you use it carefully. If you want to use advanced features, then buy its pro account which costs $7 per month. You can directly import webcam recordings, and open it in ClipChamp for further editing and detailing. If your video file size is large, you can compress it using ClipChamp and change the format of your video. Movie Maker Online is an online video maker and editor with the advanced and powerful feature set. You have to disable your ad-blocker first then open the website to start using it. It has multiple options, do not be confused. Simply upload your required photos or videos to start editing them. If your video is too long, you want to make it shorter or trim any parts, you can shorten your video through Movie Maker Online service. You can apply different filters to make your video better, give different animations effect to visualize your video more beautiful and impressive. You can view your editing at the same time by double clicking on any image. Save your video in MP4 format after editing. To use Movie Maker Online, go here. Cut the unnecessary part of the video with its cutter tool. You can also crop your videos in any frame or shape. To give a picture more attractive effect in a video, you can rotate it in 90, 180, or 270 degrees. Almost all input formats of video file are supported by the Online Video Cutter service. Edit your videos with online video cutter editing tools and give your video files a new and better look than before. After saving your files, all videos and files will be deleted, as Online Video Cutter ensures your security and privacy. You can use this website for free of cost. Youtube has its own video editor which lets you upload your video privately not for the public. Edit them with provided tools and save your video anywhere, on your system or on Youtube. 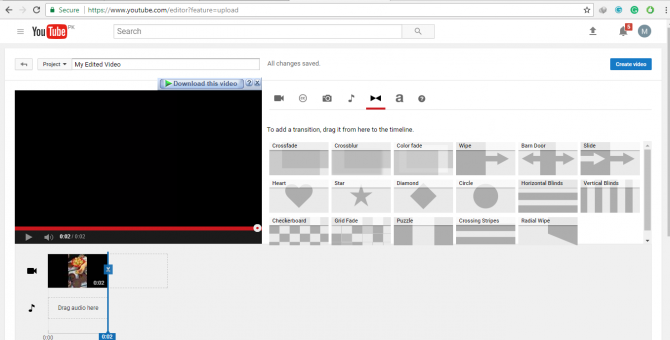 The Youtube editor can be great for editing professional videos and create great animations. Youtube editor can be a great choice for people who run their own Youtube channels. It comes with basic editing tools like brightening the videos, add different animations and visual effects. You can give a sound or music to your video by searching for their library. The good thing about Youtube editor is that it is a drag and drop editor and apart from the default video and audio, you can also add images and music. It is very easy to use, but you can use it for creating small projects or videos for personal or non-commercial purposes. To use Youtube Video Editor, go here. Video Toolbox, as the name refers, is a box of different new and useful tools to edit your videos into the impressive and beautiful look. 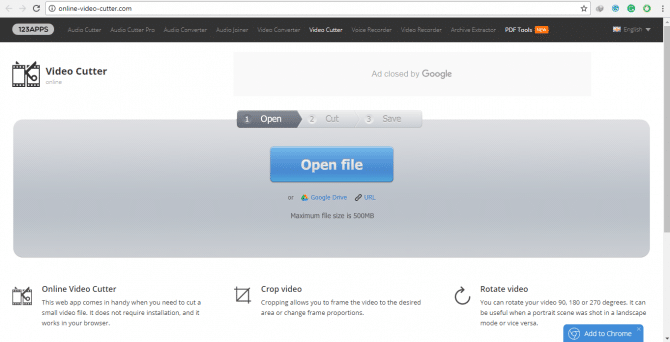 You can edit your videos on Video Toolbox to free, without any charges or fee. It allows you to process the video up to 600 MB in size. It has different output formats for videos, which you can use to change the video format of a file. You can crop or trim your video, add a text watermark effect to your video, and merge multiple video files into a single video. With Video Toolbox, you can extract audio, video, or subtitle text of any file. You can also edit the recorded videos from your webcam instantly with Video Toolbox. Add embedded subtitles for video files to increase their usability. Next in the list is LunaPic, LunaPic is not as much full of exciting and advanced features, but you can use it for basic editing purpose of video files. It is free to use for everyone. 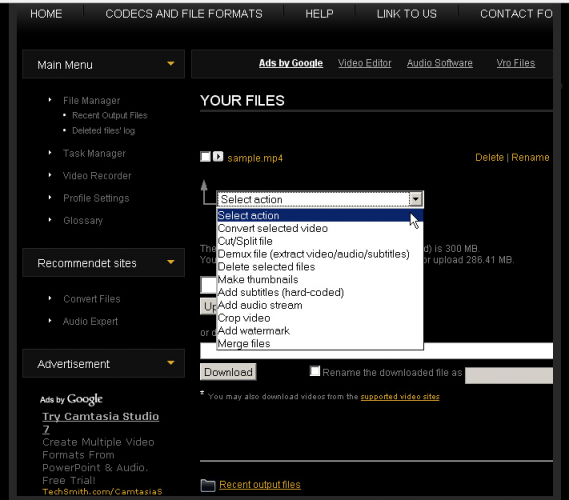 Browse video file and add it to LunaPic website to start editing it. You can crop a video, can make it shorter in duration, and set a scale size of the image. ASF, FLV, WMV, MOV, and animated GIF input formats are supported in LunaPic. It allows you to edit video of size up to 100 MB. After editing it, save it to any place on your system or directly share your edited video over Facebook, Imgur, Google+, Pinterest, Twitter, Tumblr, and EzPhoto. Pick any online video editor from the list, and start editing your videos easily as you do not need to install the tool first. Just open a website and start your work. Give different effects and transfer your video into the more impressive look. If you want royalty free images for your production, you can get them from https://www.pexels.com. Adobe also offers a free video editing platform called Adobe Spark. It also offers wonderful features for video editing especially if you are a mobile user, you can get an app for iPhone (iOS app) and Android. Which ones do you use for your editing work?